Guys, it’s time to give up the old cotton standbys and get acquainted with a new kind of underwear that has the softness and fit you want, but not the eco-overhead. What’s so environmentally taxing about cotton? It takes a ton of water (400 gallons to make a single cotton undershirt, by some estimates) and an unfortunate amount of pesticides to produce conventional cotton. So Woodiees forgoes the cotton and uses eco-friendly Tencel for its stylish boxers, briefs and boxer-brief combos. Tencel is a natural fiber made from the pulp of Eucalyptus trees. The founder of Woodiees, Bruce Brodsho, combined Tencel with a bit of Spandex to create great fitting underwear that won't ride up or bunch and stays in place without feeling too restrictive. Another benefit of the virtually pesticide-free Tencel material is that it’s easy on your skin, which is ideal for men with sensitive skin, and it’s moisture-wicking for greater comfort. 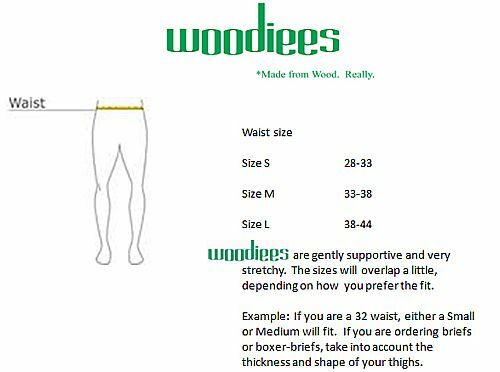 Style, softness, fit and eco-friendliness -- Woodiees’ underwear styles have what it takes to make a man comfortable. Hi Daily Grommet fans. I'm a farmer by trade and so I used to know a whole lot more about crops than the underwear business. When I read about how much more environmentally responsible it was to make fabric out of Eucalyptus wood pulp than it was to make it out of cotton, I took a look at all of my cotton underwear and thought about the impact changing this staple to a better source would make. When the Woodiees name came to me, I knew people would remember it and so I started this business. People do remember the name, but an underwear business is nothing if you don't have people coming back for more. Woodiees underwear feels good to wear, it is soft, doesn't bunch or ride, and has a bit of spandex for added movement. You'll come back for more. It turns out I'm learning a lot about the underwear business so let me know any questions you have. Interesting, but my goal is to only buy items made in USA. Ever think of *not* making them half a world away? That would be much more environmentally friendly. @Eve: Eve, I tried to find a US supplier, both on my own and through a sourcing agent. I couldn't find competitive pricing, sadly. WE LOVE our Woodiees. Not only does my husband love his, but we sell them in our Boutique and they are one of our fastest selling items. The first purchase is usually as a gift from a gal to a guy and the second purchase is because he sent her back for more because they are SO comfortable. We look forward to the day when Woodiees has a womens line. These are by far the most comfortable product on the market. If you don't have a pair you MUST get a pair..or four. My son LOVES them! He's replaced all his other undies for woodiees! As a very active golfer and hunter the moisture wicking and comfort factors that woodiees have are great he says. @Gary: Gary, that is the price per item. Try one and you'll understand that your comfort is worth it. Plus Eucalyptus fabric will naturally keep the bed bugs away from the area they are covering...whatever that area may be. @VictorK: No Comment, VictorK, not going down that road!! @Bruce Brodsho: Just goes to show how 'sensitive' we are to certain things...we can't see the forest for the (eucalyptus) trees! Bruce...bed bugs IS a big problem for children. IF you would make them in smaller sizes (like for children)along with t-shirts, you may have a good market for them. Something else, I would have thought that someone who had the guts to call his underwear products "Woodies", would 'go there'. @VictorK: I was trying to make a joke. In all seriousness, although the fabric happens to be made from eucalyptus, by the time it is processed, all that's left is the fiber, with no qualities that would be beneficial for what you suggested. @Bruce Brodsho: The hotel industry must not have gotten the report that you read and are just hyping another marketing 'untruth'. I really like the idea of eco-briefs, but at $ 20 a crack, I'll stay with cotton. If you could supply 3 pairs at $ 20, I'd be first in line to buy them. @Joey Fischer: Picture this: Chevy Cavalier or Lexus LS. Either will do the job. Which one just feels better? @Joey Fischer: My boyfriend would have agreed with you... BEFORE he tried these. Now he's hooked. He loves the boxer briefs, and he has realized that when it comes to underwear, you get what you pay for. In this case, paying a little more is totally worth it. He loves the strecth and the wicking -- both for work and when he's hunting, fishing, hiking. Do you share your fabric source with others so that those making apparel can move from cotton to tencel and your eucalyptus blend? I think the environmental case is sound, but it is hard to source good eco -fabrics. @mary L: I can certainly help you find a fabric source. TENCEL is a trademark held by Lenzing AG www.lenzing.com based in Austria. The same type of fabric can be found as a generic, but I decided to use TENCEL because of their consistent quality. We love these Woodiees eco-briefs, and the quality and feel of the underwear! I cannot wait until there is a women's and children's line too! Be daring . . . try them. Or ladies, they make a great gift, too. I purchased a pair of the boxers for my husband and he loved them so much I purchased a pair of boxers for myself in a men's small size. They're great for bedtime wear! I hope to see a women's line soon! @David: The wood raw material used in the process of making TENCEL is grown on plantations for this purpose. They don't use material from wild forests. I believe most if not all of the farms are in areas other than Australia, including areas of the US. Check the manufacturer's website for all the details. www.lenzing.com We use the fiber/fabric for woodiees, and we trust the fiber manufacturer to be environmentally responsible. What is the size break-down in inches for the S-M-L? I can't locate it anywhere. Thanks. Woodiees are gently supportive and very stretchy. The sizes will overlap a little, depending on how you prefer the fit. Example: If you are a 32 waist, either a Small or Medium will fit. If you are ordering briefs or boxer-briefs, take into account the thickness and shape of your thighs if you are between sizes. Great underwear. I have all three. The boxer briefs are the best. They are supportive, yet barely noticeable. Sometimes I forget I am wearing them. I would recommend to anyone. The fabric is really soft. I like that they are so comfortable. My wife wears them, too. We will continue to buy Woodiees! These are the most comfortable boxers I've ever worn! My wife thinks they're the sexiest thing in town (next to me, of course)! Well my Woodiees came and and I am AMAZED at them. These are unbelievable. You'll never be able to wear regular underwear again after trying these. I'm buying more. @DJP: We're glad you love them. Enjoy! @DJP: Hey, thanks for the kind words! It sounds improbable, but woodiees do become an addiction! Guys, it’s time to give up the old cotton standbys and get acquainted with a new kind of underwear that has the softness and fit you want, but not the eco-overhead. What’s so environmentally taxing about cotton? It takes a ton of water (400 gallons to make a single cotton undershirt, by some estimates) and an unfortunate amount of pesticides to produce conventional cotton. So Woodiees forgoes the cotton and uses eco-friendly Tencel for its stylish boxers, briefs and boxer-brief combos. Tencel is a natural fiber made from the pulp of Eucalyptus trees. The founder of Woodiees, Bruce Brodsho, combined Tencel with a bit of Spandex to create great fitting underwear that won't ride up or bunch and stays in place without feeling too restrictive. Another benefit of the virtually pesticide-free Tencel material is that it’s easy on your skin, which is ideal for men with sensitive skin, and it’s moisture-wicking for greater comfort.